Our washing and polishing process ensures all fine dining cutlery for hire arrives spotless and shining for your event. 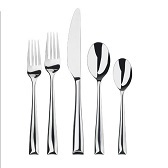 We supply various 18/10 stainless steel highly polished cutlery. If hiring 17 or more units.